For the past few months, in the gloom of my humble writing studio, I’ve been slaving away to prepare this treat. I’m finally delighted to announce that the first ever Ryan Kaine novella will be available FREE to all members of the Friends of Ryan Kaine fan club on the 1st of January 2019. Ryan Kaine: The Assessment is set a short while before the harrowing events detailed in Ryan Kaine: On the Run. Read it and learn a little more about what makes Ryan Kaine tick. 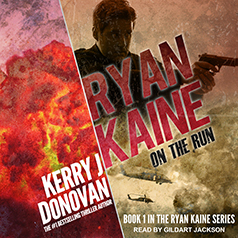 If you love action heroes like Jason Bourne, John Milton, and Jack Reacher, Ryan Kaine is going to blow your cotton socks off. If you aren’t yet a Friend of Ryan Kaine, please don’t fret, you can read a free sample of The Assessment by clicking on the cover below and following the download instructions. You’ll also find a link to the Friends of Ryan Kaine signup form at the end of the sample. I’ll finish this brief blog by wishing you a wonderful 2018 Holiday Season and by hoping you have a fantastic 2019! That’s it, thanks for taking time to read this blog. If you fancy dropping me a line, I’d really love to hear from you.